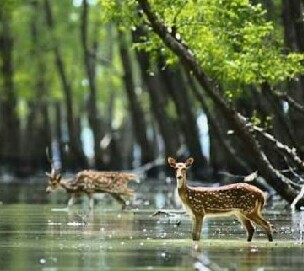 Sundarban hiron point adventurous tour package has cruise inside the forest, accommodation on cruiser on twin sharing basis, all meals form day 1 to day 3, all activities in the forest as per itinerary, small country boats for small canal / creeks, mineral water, forest fees and permission, armed forest guard from the forest department, accompanied guide during the trip. Package excludes - drinks both hard and soft, items of personal nature and items not mentioned above, fees for the video and still cameras of the guest. Dinner Dinner Menu • 1st Night: Plain Polau, Brinjal fry, Chicken rost, Dal Vuna, Salad, Soft Drinks • 2nd Night: Special BBQ Dinner: Special Porata, Chinese vegetable, Chicken BBQ, Russian Salad, Soft Drinks. • 3rd Night: Morok Polau, with Egg Salad, Soft Drinks. Day1 Plan 1st day: The tour will start for Sundarban early in the morning from Khulna Forest Ghat and it will reach inKachikhali tiger point by the evening. During the journey we will observe the beauty of riversides. In Kachikhali we will scatter for sometime, where we will go for a walk in forest alleyway and will observe the natural beauty of night in mangrove forest. After that we’ll halt for the night on the boat in Kachikhali. Visit showroom or call to buy the tour package from Khulna, Bangladesh.